Once again, the United Nations Security Council convened in emergency session on Wednesday to denounce Syria and Russia over the plight of civilians in the war-torn city of Aleppo. An offensive begun last weekend by pro-Syrian government forces, backed by Russia, has recaptured 40 percent of the city’s sectors that were held by various Al Qaeda-linked and other Islamist militias since they launched a civil war against the regime of President Bashar al-Assad in 2011. Thousands of people are fleeing from the US-backed Islamist militias. Syrian government officials have asserted they will retake all of Aleppo by the end of the year. US ambassador to the UN Samantha Power was among those who addressed the Security Council. Power spoke as the representative of the Obama administration, which actively intrigued with the Islamist militias to initiate the war against Assad. Washington has worked with Turkey, Saudi Arabia and the Gulf State monarchies, as well as the European powers, to recruit, fund and arm the “rebels.” It has used the Islamists as its proxies in a pro-imperialist regime-change operation. The result has been over 400,000 deaths, the displacement of over 10 million people and the destruction of much of Syria. The Russian-backed Syrian government offensive in Aleppo is, without question, brutal and merciless. Professions of concern by US imperialism, however, which has ravaged much of the Middle East over the past 25 years, carry no political or moral weight. Power’s rhetoric and similar statements in the Security Council by US allies, such as France, Britain, Spain and New Zealand, were even more grotesque given the character of the US-directed assault underway on the Iraqi city of Mosul. Six hundred kilometres to the east of Aleppo, the US and its allies are assisting an Iraqi government offensive against the Islamic State of Iraq and Syria (ISIS) which, bolstered through Washington’s intrigues in Syria, crossed into Iraq and took control of Mosul in 2014. The US-backed regime in Baghdad claims the city is now fully surrounded by tens of thousands of Iraqi Army troops, Kurdish forces and various Shiite militia members. A claim, repeated in an Associated Press report, that the US-led forces are “avoiding the use of overwhelming power to protect civilians,” is crass propaganda. The Iraqi military has asserted that the ISIS fighters intend to “fight to the death,” effectively ruling out any prospect of negotiations. Leaflets have been dropped instructing the up to 1.6 million civilians trapped in the city to remain in their homes, while a “coalition” of American, British, French, Australian, Canadian and Jordanian aircraft bomb suspected ISIS positions. A November 24 humanitarian overview by aid organisation REACH reported that families are crowding into the lower floors of housing complexes out of fear of the airstrikes. The Iraqi military boasted this week it has killed 1,000 ISIS fighters, while ISIS has claimed to have killed over 3,700 pro-government and Kurdish troops. No credible figures are being provided by either side on the toll inflicted on civilians, but reports suggest it is high. West Erbil Hospital, located some 80 kilometres away from Mosul, is admitting 150 military and civilian casualties every day. The only wounded civilians who could reach the hospital are those found in areas captured by government forces. Thus far, barely 70,000 people have managed to escape. 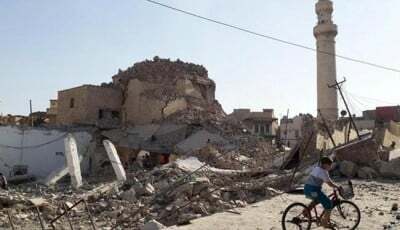 Mosul—a city with a history stretching back over 4,000 years—is literally being destroyed in order to “save it.” Bombing this week destroyed a major water pipeline in the eastern suburbs, cutting off water to some 650,000 people. Electricity is already largely cut. Food prices have reportedly doubled as supplies dwindle. The city’s health system is dysfunctional. The university and numerous other public buildings have been reduced to rubble. On Wednesday, coalition aircraft bombed and “disabled” four major bridges over the Tigris River that link the western and eastern sectors of Mosul, further isolating the population in the east from potential resupplies of food and other essentials. The siege of Mosul is predicted to continue for weeks, if not months. As winter and freezing temperatures set in, exposure, starvation and disease will likely take more lives than the bombing, particularly among children, the infirm and the elderly. The Obama administration did not this week demand ceasefires or “compliance with international humanitarian laws” in Mosul. The attitude of the imperialist powers to war crimes is determined by whether they benefit from them. In Aleppo, the interests of the US and European powers are being set back, so there is condemnation and calls for action. In Mosul, US interests are being asserted, so civilian deaths are downplayed or outright denied. Whenever representatives of imperialism and the capitalist ruling elite speak of “human rights,” the independent standpoint of the working class must be contempt and hostility. The only way to end the criminality of imperialist war and neo-colonial intrigue is to end capitalism itself.